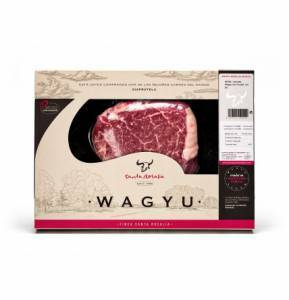 The meat comes from the Wagyu breed of cattle, which was originated in Japan and is also known as Kobe meat. 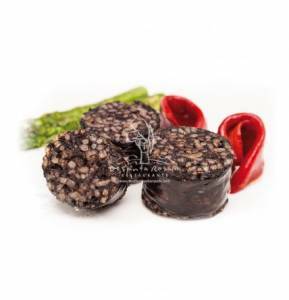 It stands out from the rest thanks to its extraordinary culinary uses and is one of the most select and highly-prized meats in the world. In love with these animals, more than 15 years ago, Patxi Garmendia embarked on the task of importing pure stallions and embryos, achieving, after a lot of effort, their own genetics based on a selection of animals from the most pure Wagyu lines, the Wagyus of “Santa Rosalía”. With more than one hundred square meters of extension for each animal, facilities provided with musical thread, biodegradable beds, that we later use as organic fertilizer in the own lands, and a food that we ourselves elaborate with green fodder, flakes of cereals and organic wine of the own cellar as a natural source of antioxidants, among many other ingredients, our Wagyu animals, enjoy a special welfare in Finca Santa Rosalía. Concerned about the global warming of the planet (9% of the gases that cause the greenhouse effect is caused by the gases of the cattle in general), we have designed an exclusive food for our wagyus, lacking of additives and of such digestibility that they do not produce contaminating gases, making the meat of the animal into a delicious product and especially healthy for human consumption. Animals, strictly complying with all the requirements of animal welfare, are sacrificed free of stress, therefore, transportation to the slaughterhouse is carried out in our own trucks so that the animals travel calmly, being accompanied by the same staff that cares for them, not having to wait at the entrance or mix with other animals. Without leaving the farm, we complete the cycle supervising and controlling the quality of the meat until the packaging of each of our products, with strict controls of health and traceability. 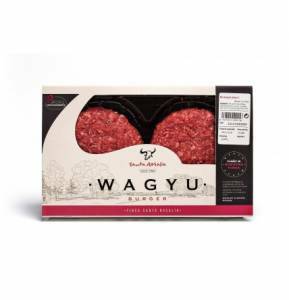 The Wagyu meat from the Santa Rosalía estate is clearly different from that of any other bovine breed, being absolutely superior in quality, highlighting aspects that define an extremely tender and juicy meat whose fat is rigorously healthy for human consumption, as it contains a high percentage of unsaturated and polyunsaturated fatty acids, such as oleic, linoleic or conjugated linoleic acids (omega 3, 6 and 9), which help prevent, among other things, cardiovascular diseases.